The 34th meeting of the Vietnam-Cuba Inter-Governmental Committee wrapped up in Havana, Cuba on November 23 with the signing of three agreements on fostering bilateral ties in economy, science and technology. Addressing the closing session, Cuban Minister of Foreign Trade and Investment Rodrigo Malmierca stated that the meeting helped consolidate the traditional friendship between the two Parties, Governments and peoples. Malmierca pointed out joint tasks of the two countries in improving bilateral economic partnership to match the sound political relations of Vietnam and Cuba. He affirmed that both sides are ready to seriously and persistently fulfil the goal. He also revealed that the two countries have designed a roadmap for their bilateral ties’ growth in the middle term, prioritising projects in tourism, construction and health care. 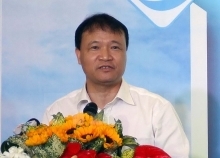 Minister of Construction Pham Hong Ha agreed with the Cuban side on the enhancement of the effectiveness of activities of the committee as well as the strengthening of bilateral partnership through specific projects in the future. He also called on both sides to better their business environment to attract more investment projects from each other. The two sides underscored the significance of the meeting, which is held on the framework of President Tran Dai Quang’s visit to Cuba. They also agreed to sign a number of bilateral trade deals in early 2017. Ha and Malmierca also inked a protocol on the bolstering of economic and trade partnership between the two countries, while witnessing the signing of agreements on the formation of a joint venture for production of flagstone and ceramics in Cuba. At the signing ceremony, representatives from Viglacera of Vietnam and Islazul tourism group inked a cooperative agreement on upgrading several hotels in Cuba. 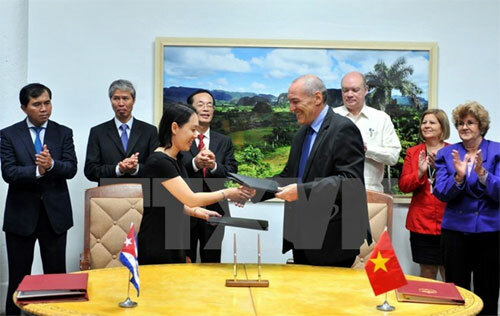 Cuban Vaccine Filay also signed a deal to develop vaccine against typhoid with Vietnam’s Davac company. Earlier, the Vietnamese delegation also had meetings with leaders of the Foreign Trade and Investment, Construction and Tourism Ministries./.